October is National Cyber Security Awareness Month, and this week's theme is “Recognizing and Combating Cybercrime.” This week focuses on the different types of online crime and offers suggestions on how businesses and individuals can protect themselves. 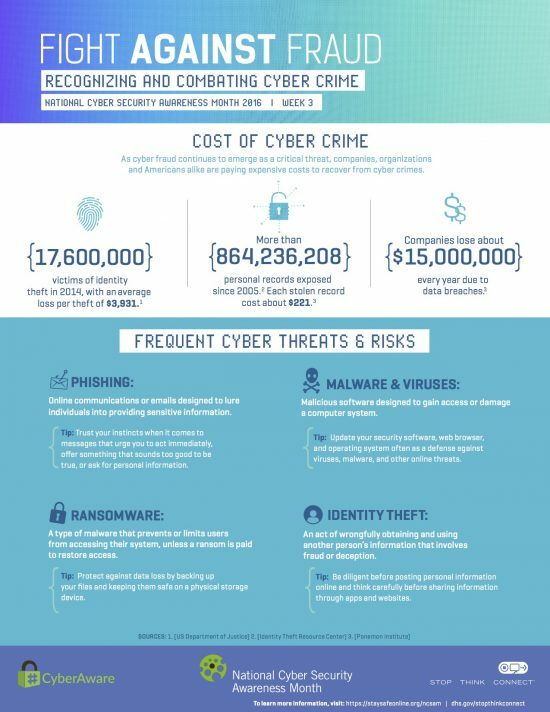 Small and Medium size businesses are also at risk, and NCSAM has put together this workbook to help these organizations assess their risks and make a security plan. This resource focuses on the three key areas of prevention, resolution, and restitution. This workbook helps small businesses create custom cybersecurity plans. You can download the plan as a pdf document here. A proper security strategy will protect a company's resources, data, reputation, customers, employees, and more. Visit the NCSA website, Business Safe Online, for more information on this topic.